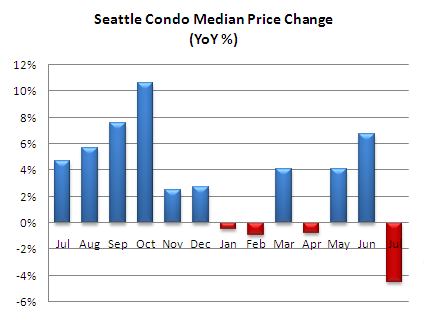 July exemplified the fluidity of the housing market…it was tough month for Seattle’s condominium market. 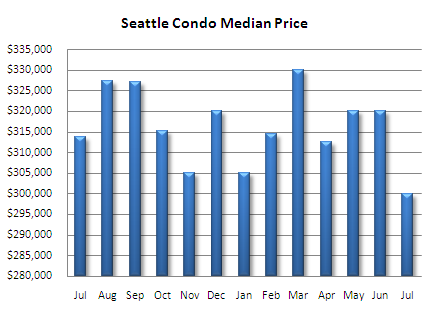 After median price gains over the past couple of months, the median price took a tumble to $299,975 last month, which reflected a 4.5% decrease compared to the same period last year and the fourth year-over-year decrease this year. Though, not all was negative. 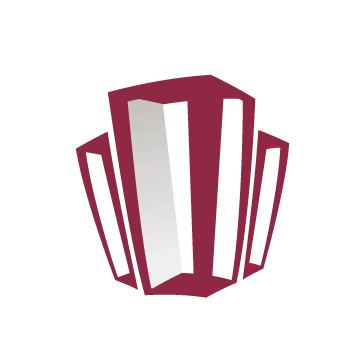 The number of active listings decreased for the second consecutive month to 1,539. That number reflects just 14% more listings compared to July 2007, the smallest year-over-year percentage we’ve seen in over two years, and a significant reduction since January’s 65% difference in actives. Relative to last year, which was a seller’s market, there aren’t that many more properties on the market, yet we are considered to be in a buyer’s market. That distinction, though, is largely based on the fact that so few buyers are actively purchasing condos. 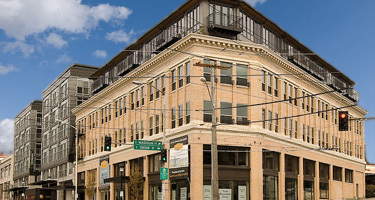 The number of properties going under contract fell to just 202 units, or 19.5% fewer than June and 46.8% fewer compared to July 2007. 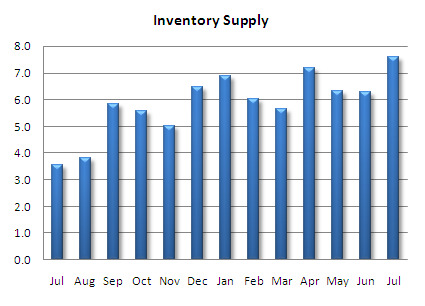 The condo inventory supply rate (absorption rate) rose to 7.6 months based on pending sales, the highest level spanning back several years. 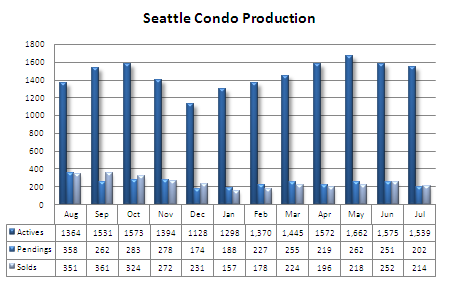 Downtown, MLS area 701, and West Seattle, MLS area 140, led the city with 9.8 and 9.9 months, respectively. 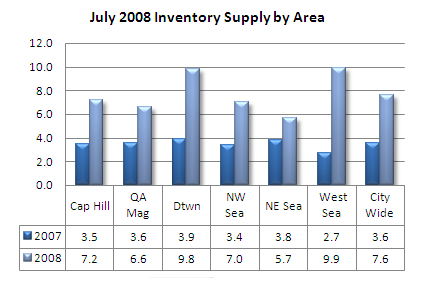 Yet, Downtown’s high rate wasn’t due to rising inventory (same number of actives in both 2007 and 2008) but due to the number of properties purchased, 83 in July 2007 compared to just 33 last month. Based on my observations so far this month I expect more of the same. 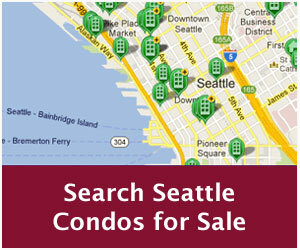 Whether this is good or bad news depends on if you’re a seller or a potential condo buyer. If you’re a seller you’re faced with a shrinking pool of interested buyers and volatile prices. Though, if you need to sell, are willing to accept the current market environment and price your property accordingly, you shouldn’t have difficulty selling. If you’re a buyer, you have the benefit of downward pricing trends and less competition from other buyers, yet there isn’t a fire sale on condos in the city. 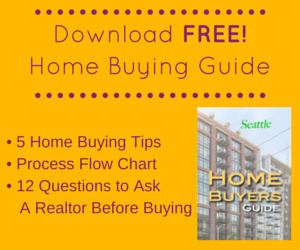 Additionally, buyers can now take advantage of a first time buyers tax credit. The credit is based on the purchase price and maxes out at $7,500, subject to eligibility requirements. There is a potential that the number of active listings may continue to drop as seller’s pull their properties off the market, many renting them out instead, while waiting for the housing environment to improve. And, that may help to normalize the market. The “tax credit” is a little more complicated than that. C – definitely, and buyers should be in communications with their loan officers and/or accountant to review eligibility and payback requirements. Looks like a somewhat tough real estate market up there especially with condos: inventory is up, and prices are down makes it look like a good time to buy for investors. I would imagine that Seattle is a fairly international city – and given the declining value of the dollar relative to other currencies, have you considered marketing to other countries? I would imagine there would be some international real estate investors that would like to pick up on the win/win (declining dollar), and somewhat soft real estate market.